Did you know your website could be losing more than 50% of its leads? Get up to speed on the small tweaks you can make right now to compel those folks to stick around. 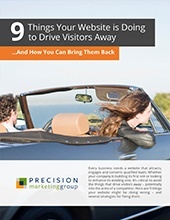 Here's a scary fact: roughly half of all readers who visit your website aren't coming back. They bounce. And they take their business with them. If your site is losing 50% of its leads (or more, in many cases), small changes to your message, your design, and your basic web practices could produce huge returns – just by incenting visitors to spend more time on your pages. Plus bonus SEO information, which will also help more leads find your site! Learn how to bring back those leads with a better website development strategy. Simply fill out the form to get your guide right now! © 2019 Precision Marketing Group, LLC.